Changes and partly new prices for the vignettes in Austria, Slovenia and Switzerland. Halloween 2016, more than 100 bikers gathered in Leeds / England. They met in the Kirkstall Road, then drove together into the inner city, also through pedestrian zones, arcades and generally disturbed the traffic. 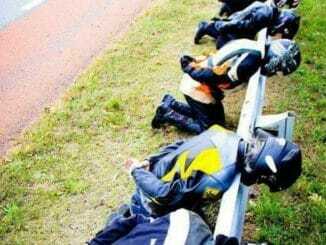 Rumble strips are used more and more to tackle the so-called motorcycle racer in Germany. What does the new method in the fight against the accident statistics? Or can lead to accidents and harassment rumble itself ??? Help, it’s wet! When wet, you can not drive …? A wet spot on the road and you take the beads of sweat on his forehead. When wet, there is indeed no grip and lubricates immediately, right?